Astronaut Mark Kelly, the husband of Arizona Congresswoman Gabrielle Giffords, who was among 20 victims of a horrific shooting in Tucson, Ariz., on Saturday, says "there is little that we can do but pray." In a statement released today (Jan. 10) through Giffords' office, Kelly expressed his appreciation for the support shown to him and his family in the aftermath of the weekend shooting. "On behalf of Gabby and our entire family, I want to extend our heartfelt gratitude to the people of Arizona and this great nation for their unbelievable outpouring of support," Kelly wrote. "Gabby was doing what she loved most – hearing from her constituents – when this tragedy occurred. Serving Southern Arizonans is her passion, and nothing makes her more proud than representing them in Congress." Giffords (D-Arizona) was holding a constituent meeting at a local supermarket in Tucson when a gunman opened fire shortly after 10 a.m. MST (12 p.m. EST). Giffords, who was shot in the head, was rushed to the University Medical Center of Tucson, where she underwent emergency surgery. She remains in medically induced coma, but doctors today say that she is "holding her own," reported MSNBC.com. In his statement, Mark Kelly acknowledged the six people who lost their lives in the massacre, saying "we must never forget them, and our prayers are with their families." To those who were injured, Kelly extended his hopes and prayers for their quick recovery. "Many of you have offered help," Kelly said. "There is little that we can do but pray for those who are struggling." 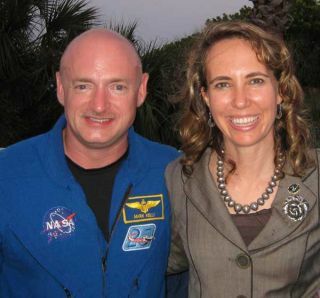 NASA astronaut Mark Kelly is a veteran of three space shuttle flights, and is scheduled to command the final flight of space shuttle Endeavour, which is slated to launch April 1. His identical twin brother, Scott Kelly, is also a NASA astronaut who is currently living aboard the International Space Station as commander of the Expedition 26 mission. Over the weekend, Scott Kelly released his own statement via Facebook from the space station. "I want to thank everyone for their thoughts and prayers, words of condolences and encouragement for the victims and their families of this horrific event," Kelly wrote. "My sister-in-law, Gabrielle Giffords, is a kind, compassionate, brilliant woman, loved by friends and political adversaries alike – a true patriot: What is going on in our country that such a good person can be the subject of such senseless violence? It's a sad day." Scott Kelly and his Expedition 26 crewmates on the station observed a moment of silence for the victims of the Tucson shooting at 11:00 a.m. EST (1600 UTC), led by President Barack Obama. "We have a unique vantage point here aboard the ISS," Scott Kelly said before the moment of silence. "As I look out the window, I see a very beautiful planet that seems very inviting and peaceful. Unfortunately, it is not. These days, we are constantly reminded of the unspeakable acts of violence and damage we can inflict upon one another, not just with our actions but also with our irresponsible words. We are better than this. We must do better."